This project began after the homeowners bought the property to begin building their dream house. To have the home they had always imagined, many outdoor living elements needed to be incorporated into their large landscape. 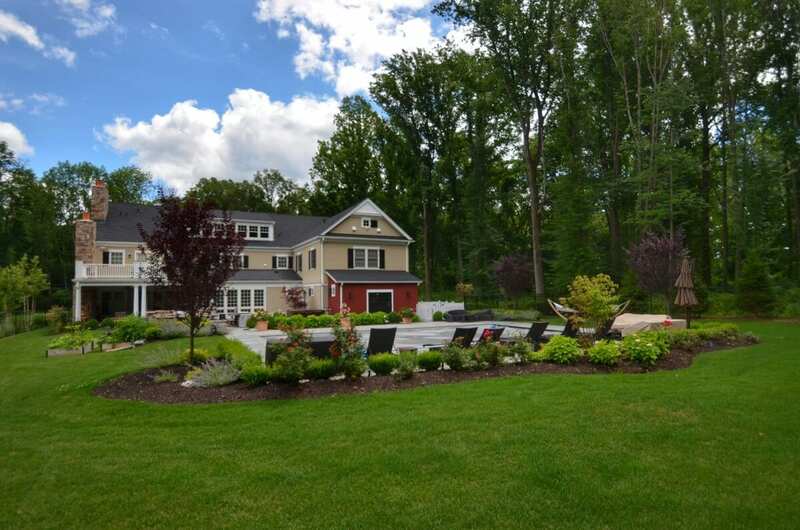 This full property landscape design and build took approximately three months to finish and in the last two years has truly flourished into a mecca of thriving plant life and fun entertainment. 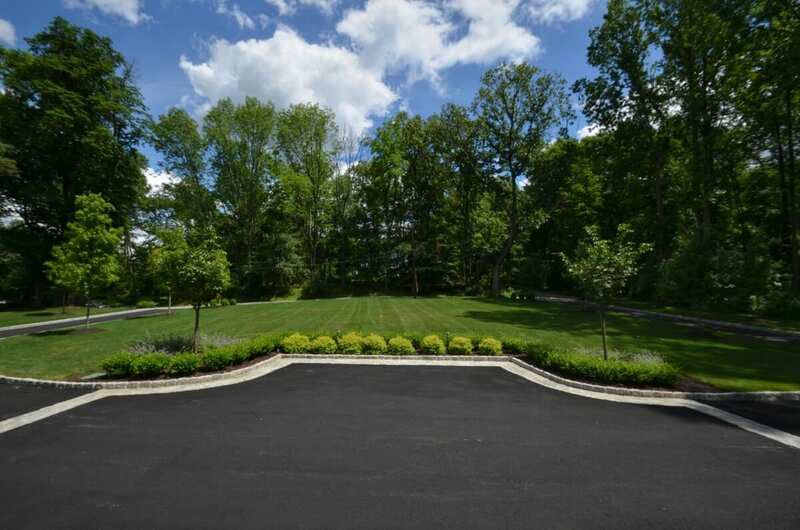 In the front of the home, a circular driveway with Belgium block inlays was constructed to give the property an appealing grand entrance. 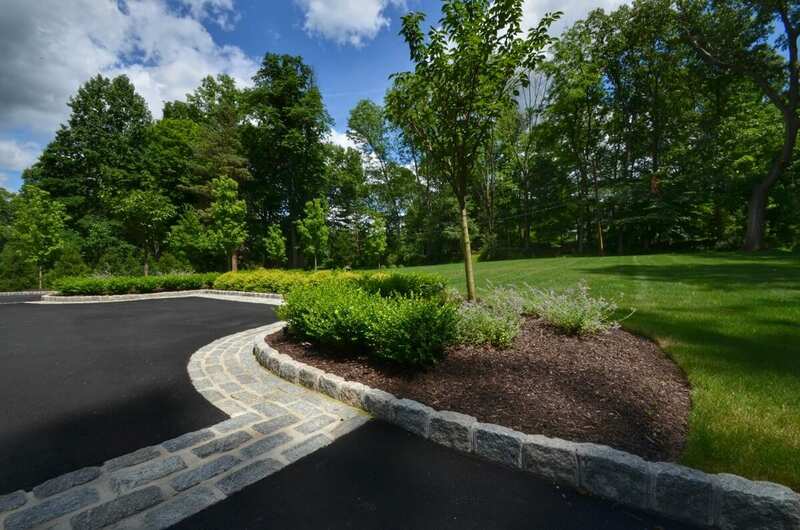 Trees, shrubs, and flowers that will continue to mature, were planted along the driveway to create intrigue and more privacy from the road. Garden beds were designed to line the front of the home with welcoming greenery and seasonal flowers. 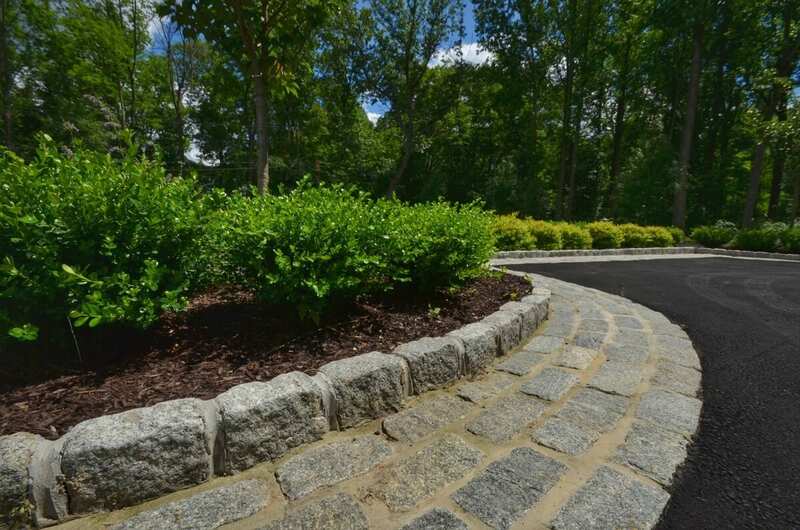 A stone path was created between the driveway and the side of the home for easy access to points of egress. 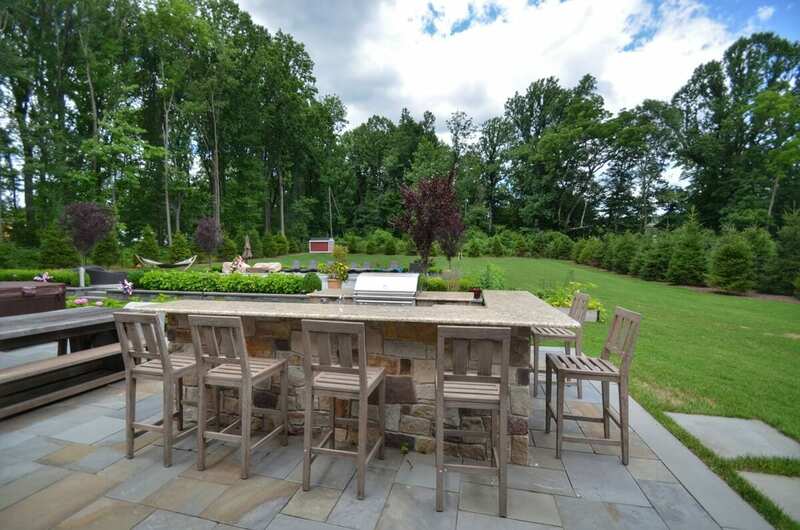 In the backyard, a large bluestone dining terrace with custom outdoor kitchen and bar was constructed to comfortably entertain many guests. We included a full depth concrete footing. The cabinets were constructed out of cinderblock. The kitchen and bar were then veneered with natural stone to match the veneer stone found on the house for a customized look. The separate bar unit has a 42” raised bar countertop that allows for up to 6 seats. A covered gunite pool was built with plenty of space to sit in the sun and relax. 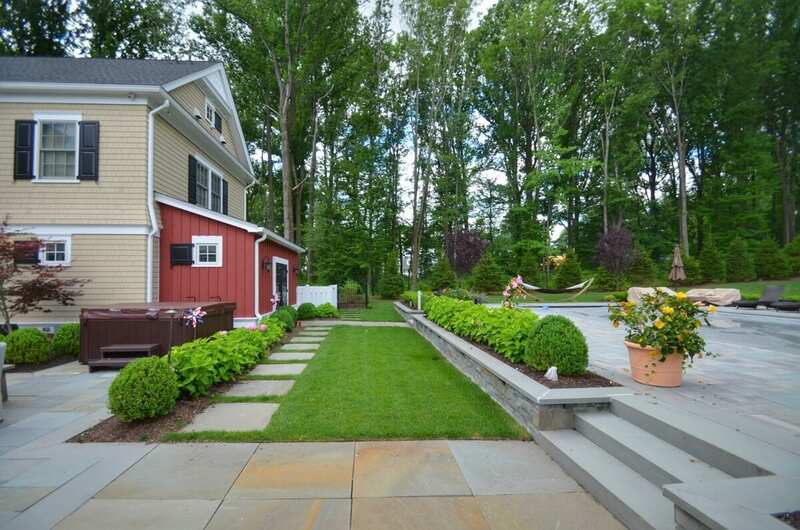 Custom stone retaining walls and pavers were designed to surround the pool area, giving it a feel of separation from the other outdoor entertainment areas in the yard. 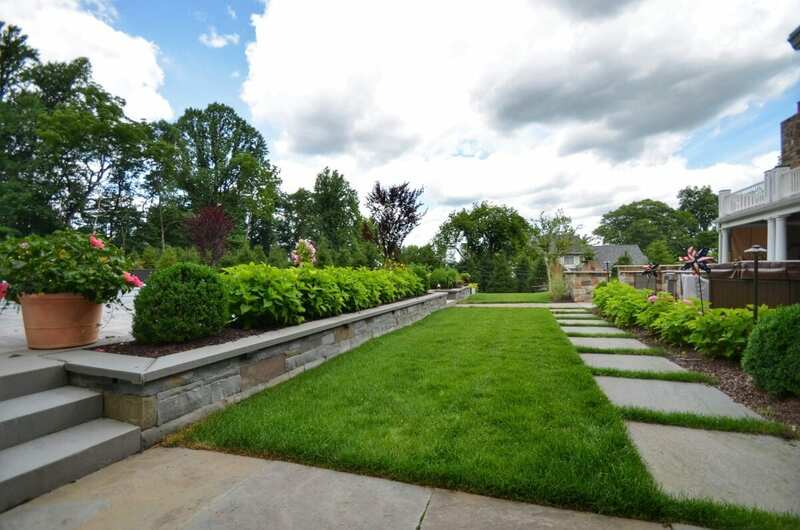 Yearly plant maintenance has been done at this property since the completion of its landscape design and construction. 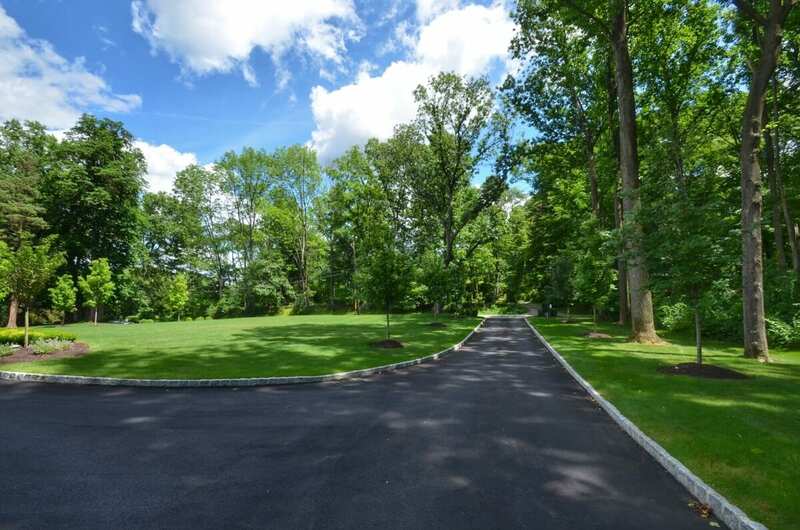 Belgium block was utilized for the driveway and parts of the retaining walls throughout the property. 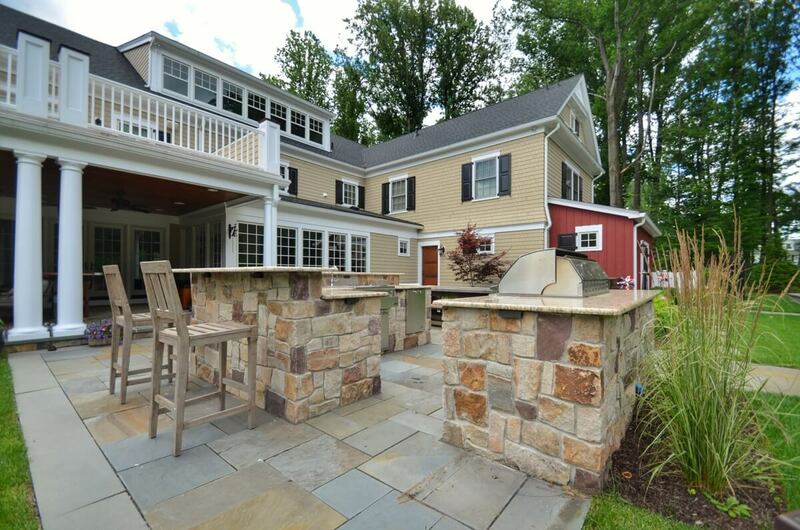 Stacked bluestone was also incorporated into the retaining wall design to give an aesthetically pleasing look of varied texture and materials. 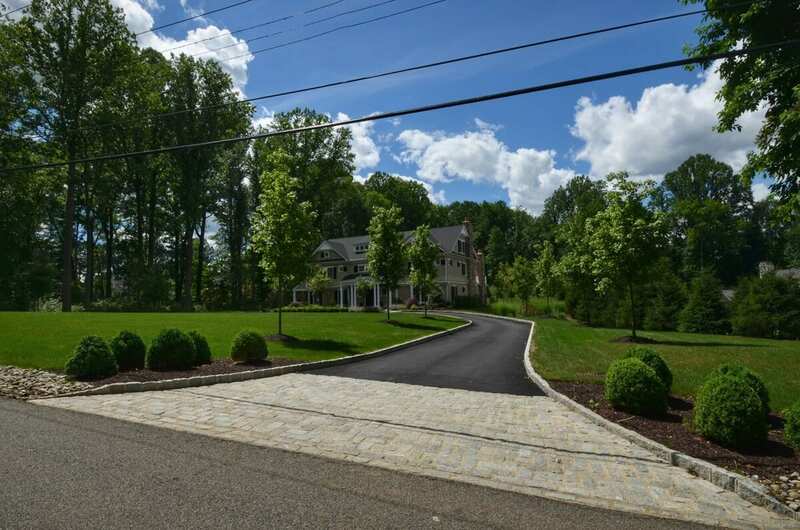 Dimensional bluestone steps were used in the front and back of the home for durability and correlative look to other materials used throughout the project. Lynx stainless steel appliances were installed throughout the outdoor kitchen and bar area. The bar and kitchen countertops are granite. The appliances include sink, cocktail station, refrigerator, trash door, 42” gas grill, and access doors and drawers. GFI outlets are found throughout and custom low voltage lighting was mounted under the granite countertops. Extensive low-voltage LED landscape lighting was placed in the front, sides and back of the home to produce safe walkways at night and to spotlight significant design pieces on the property. 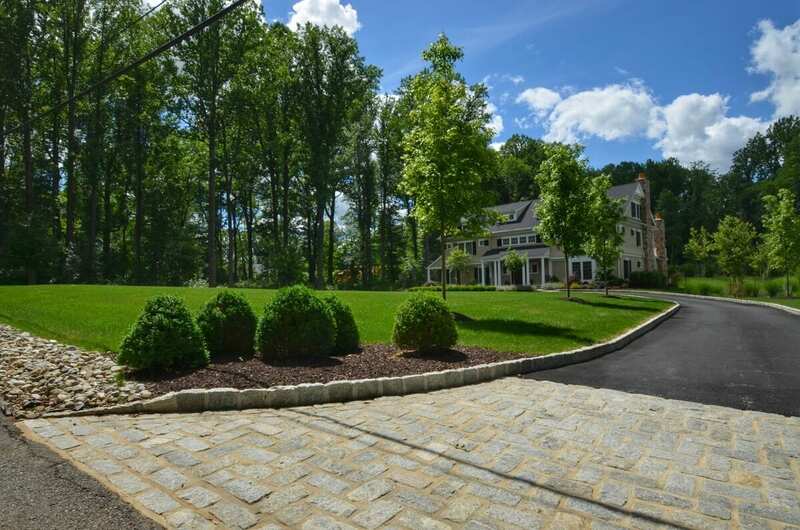 This included the row of trees lining the driveway, front foundation lighting, rear foundation lighting, and the lighting for the outdoor kitchen and pool. To create privacy near the side and back of the home aluminum fencing and a greenscreen of evergreen trees and shrubs were put in place.